What would it take for you to sacrifice yourself to destroy your political opponent? The destruction of much of the remainder of the Japanese fleet and its air arm in the latter half of 1944 left the Japanese Home Islands vulnerable to attack by US naval and air forces. In desperation, the Imperial Japanese Navy proposed using “special attack” formations, or suicide attacks. These initially consisted of crude improvisations of conventional aircraft fitted with high-explosive bombs that could be crashed into US warships. Called “Divine Wind” (Kamikaze), the special attack formations first saw action in 1944, and became the scourge of the US fleet in the battles for Iwo Jima and Okinawa in 1945. In view of the success of these attacks, the Japanese armed forces began to develop an entire range of new special attack weapons. 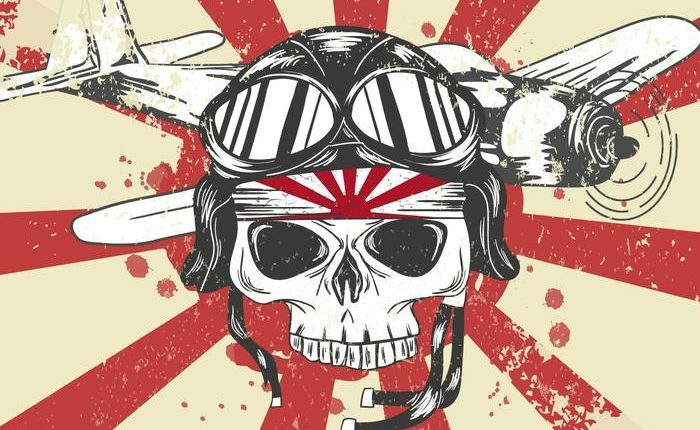 The Japanese maneuvers and tactics were successful because they traded one man and one plane for multiple lives and ships while increasing terror and surprise. In an era prior to cruise missiles, laser guided rockets and drones, these manned and piloted bombs were the only alternative to dropping payloads in order to increase the destructive effectiveness of aerial weapons. Certainly, democratic operatives would not self-immolate in a vain attempt to destroy President Trump, would they? This investigation (from Obama’s DOJ, through Comey’s FBI now the Mueller Office of Special Counsel) has been a slow burn. As it progresses it is becoming clearer that it is only a win-lose proposition, as it always has been. There is no middle ground. Either Trump finds his way through this Gordian knotted web of deceit or the democrat-media complex will destroy our rule of law and Constitution in order to stand over the 45th presidents political corpse. If the chance of success is very low for the prosecutors of Trump, then everyone involved is assured a slow death. And because this weaponized intelligence and the crimination of political differences is used in an attempt to bludgeon a sitting president in slow motion, the suicide process is masked. Yet, each member of the deep state cabal has a hope that their attacks will succeed. This was always a high risk-reward scenario for the participants. However, they seem to view this as part of an overarching scheme where they have political, professional and personal cover from both the media and the judicial system. Do Clinton and Obama have any concern that their violations of the Constitution and The Code of Laws of the United States of America, or USC, are going to be prosecuted? Apparently not. Does Comey fear that he will be put in jail? I doubt it. Even after his interviews bombed and his book tour is fading I don’t see him entertaining the coming hangover. And, then the reckoning should come. Does Mueller regret taking on this special counsel appointment? It would seem that at some point he would fear for his reputation. But, he must be so entrenched in the DC swamp that he cannot see a scenario where he is not praised and lauded for his actions. He must believe he is protected, and possibly guaranteed success. I believe he thinks that this system is rigged in his favor, and he can get his man Trump and leave smelling like a rose. All this while his plane is in a nose dive. The more crimes that are revealed the less plausible it is that manufacturing a crime by Trump will hold up. The musical chairs tune is almost up, and will Mueller want to be left out, holding the bag? McCabe should flip on his coworkers. Maybe he has studied the prisoner’s dilemma which indicates that not talking to the police is better than talking, when you are assured that your cohorts will also not talk. But the egg is going to crack. Someone in this gang will talk at some point in the coming years simply to mitigate their impending sentencing. The crimes committed are too extensive. And regardless of who is in charge of the DOJ, Sessions or the next AG, there will be a coming justice. You can bank on it. Strozk and Page are pawns in this game. But they persist in their labors at the FBI. At what point do they crack? The psychological pressures of keeping up appearances of competence and innocence will wear on them. Like Bruce Ohr, these underlings with an over inflated view of their role may face prosecution. They are on the warpath to a near certain doom. Weisman joined the Mueller team as the pit bull. He was going to help bring Trump down. When does he realize that the jig is up? How long will he persist in his line of attacks? Does he really believe that he can eradicate legal restraints in this suicide mission and escape unscathed? That is becoming more and more unlikely. He will most likely be held to account for each and every prosecutorial indiscretion he has engaged in. But he is committed to the cause as a true believe would be. He has drunk the Kool-Aid and willing to see this through. Rod Rosenstein recently barked at Congressional oversight as extortion. He has no remorse for the role he’s played in denigrating this nation in dragging Trump through the mud. The process of getting Trump has exceeded the bounds of a legal investigation from the jump. Beginning with the Steele dossier and the FISC this special counsel should never have been appointed. And Rosenstein efforts to protect Mueller and the FBI from oversight and avoiding the reveal of the extent of coordination, leaking and narrative crafting by the FBI and others is only going to make this worse. He is like a child flailing about banging his head on the ground in order to avoiding taking medicine. And the jagged little pill will be swallowed eventually. Brennan and Clapper act like outside observers when they have been involved in the misuse of intelligence products and the agencies which compile and analyze intel throughout the Obama administration. However, they continue to tweet and talk as if they did not participate in the sham and corruption that has led us to the brink. Cheryl Wills and Huma Abedin are unassuming co-conspirators of Hillary Clinton. They believe that they have immunity due to their proximity to the Hildabeast. Is that confidence warranted? We will find out. If there is any justice in the world eventually these women will be forced to testify under oath. And then their perjury and obstruction will be held to account. But, they have no fear of this possibility. These women seem to go on living despite their massive exposure in a variety of cases. Loretta Lynch and Susan Rice are known to have skirted regulations in the prosecution of crimes, the use of classified information and may have violated numerous laws. Yet they remain outside of the scope of any known investigation to date. How can these women become invisible to the DOJ without the justice department participating in a cover up of their past misdeeds? How many other people aided them in their actions, lies and deceit? From where does the assurance of deference and ignorance of past crimes emanate? Eventually we would like answers to these questions. When (not if) we get justice, the list of the victims of their own devices will be long and noteworthy. It seems that they have the utmost confidence not in their own innocence but in the establishment protecting its own. However, the establishment only has power while in power. We are seeing the worm turn and the uprooting of entrenched bureaucratic weeds. The foundations of the institutions are crumbling, and a new edifice may be erected that will not abide the solipsism of the criminal element within the administrative organization. From that point forward, the martyrdom of these deep state operators will be certain.